You are here: Home » FSM, Pirates & Space. Statistics at work. This was going to be a post on how statistics can be used. It’s not going that way. Well, not fully. I’ve got to start off talking about religion. 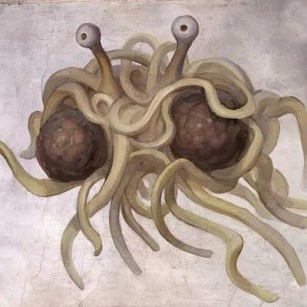 The religion I will be talking about is the followers of the Flying Spaghetti Monster [FSM]. Pastafarianism. Now, you may wonder where this is going as I’ve played the religion card. Don’t worry. The main reason for this post will become clear. Belief can be a strange thing. Even more so with religions like Pastafarianism. 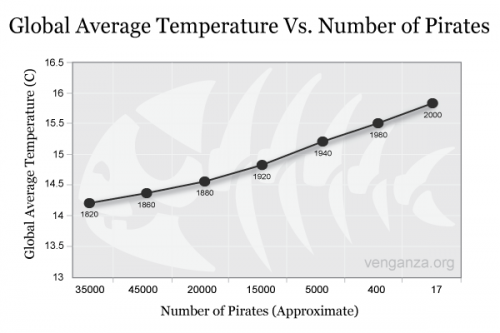 Followers of the FSM believe the reason we have a rising Global Average Temperature is because of the lack of pirates. The evidence is there to see. Why are the mainstream press and scientists ignoring this correlation? Is there a conspiracy to keep this silent? What about Somalia and their pirate activity? Well, thanks for asking! Just look at the evidence and the answer is clear. They have the highest number of pirates and the lowest carbon emission of any country 🙂 Proof that the FSM is correct and should be worshipped if you want a cooler Earth! We can use statistics to prove our point. Almost using the same data but manipulated in a way to show your point of view. A good one to prove this outlook is using the below two statements. Space flight is the safest known form of transport ever invented. Space flight is the most dangerous form of transport. How can both be true, you ask. It just depends on what statistics you use. The first statement is true if you apply miles travelled per death. The second is true if you use deaths per number of people flown into space. The number for the second maybe higher that we think as a lot of Russian space deaths were covered up by the government. For the final part. I have asked around the office to challenge me to make a correlation between two distinctly, different items. Be that Global warming Vs Global sprout production. It was off to the Interweb to find my own, spurious, links. That website was discovered!